Jyothiprajwalana by chief guest Dr. Sanjeeva Reddy, guest of honor Dr. P. V. Rao, Narender Reddy, J.C. Shaker Reddy, Rajeshwar Gangasani, and coordinator Bala Indurti. Children singing “Tenela Tetala Matalatho” touched the hearts. Feb 18th, 2012 was a great day for Telugu music lovers in Metro Atlanta. 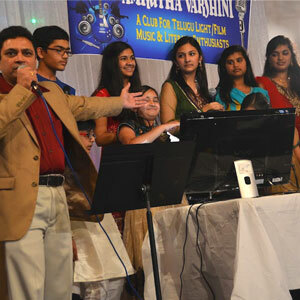 Amrutha Varshini organized a grand musical night and Antakshari competition. Eleven groups of active participants played the Antakshari event, conducted by the dynamic duo of Venkat Chennubhotla and Phani Dokka with support from Sneha Chaturvedula and Shanthi Medicherla. Dr. Sanjeeva Reddy was chief guest and Dr. Pemmaraju Venugopala Rao was guest of honor. The six hour fun fest was guided by Bala Indurti and his team of volunteers. Amrutha Varshini was founded in 2006 by Venkat Chennubhotla supported by Phani Dokka and Lakshmi Vedala to promote Telugu literature in the USA and to encourage Telugu light music. Amrutha Varshini organizes literary meets and light music concerts alternatively on a monthly schedule. This program began with Jyothiprajwalana by Dr. Sanjeeva Reddy, Dr. P. V. Rao, Narender Reddy, J.C. Shaker Reddy, Rajeshwar Gangasani, and Bala Indurti. Over 600 people were present to enjoy the scintillating evening marked by fierce but friendly competition among the 55 participants from the 11 teams that battled it out to win the Antakshari competition. A potpourri of creative infusion from Venkat and Phani held audience interest. A round of charades was probably a maiden venture for many music enthusiasts and kept the audience in splits of laughter. Dr. Vijay Vemulapalli and Ramesh Duvvuri were judges, and after 8 rounds of such creative mixes, the team of Vinod Gandikota, Uma Jamshed, Sunitha Medharametla, Sandhya Ganti and Sujatha Eemani took the honors, winning the coveted first place and bagging gift cards worth $500. After dinner the festivities continued. The melodious “Tenela Tetala Matalatho” was presented by a group of children. The crowd of 600 watched in silence as the magic of the patriotic moment unfolded, and it was no surprise to hear the normally controlled Venkat’s voice falter with emotion as he declared that the rich legacy of Amrutha Varshini had been ascertained by the young children. As we trudge through our daily pattern of life, it is not often we get moments to introspect and relish our rich legacy. Institutions like Amrutha Varshin remind us of what we were and what we can be.